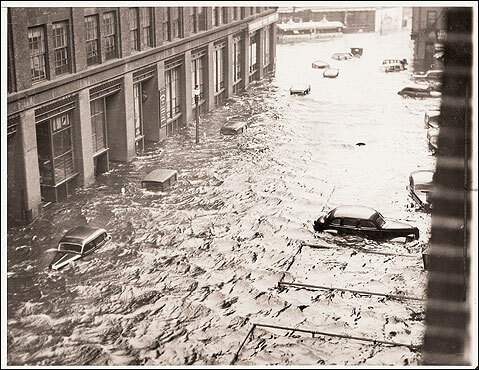 The New England Hurricane of 1938, also called the Great Hurricane, had just plowed across Long Island. It left dozens dead, houses washed away, and sliced part of Long Island in half, creating the Shinnecock Inlet that we know today. The hurricane, unexpected and ferocious, was aided by the highest tide of the year (it was the Autumnal Equinox), and at high tide for New England. The hurricane slammed so hard into Long Island that seismographs 3,000 miles away registered as an earthquake. It was now heading for Connecticut, Massachusetts, and Rhode Island. In 1938, communications were slow and spotty. The coastal towns of New England were completely unprepared. Weather reports had called for “cloudy conditions” and “gusty winds,” which was not unusual for New England coastlines. The extreme storm surge of the 1938 hurricane was beyond anything coastal residents in New York, Rhode Island, and Connecticut had ever experienced or written about. There was no historical comparison. Several survivors along the coast of Rhode Island, stated that at the height of the hurricane, they saw a 40-foot fog bank rolling toward the beach, when the bank got closer, they realized it wasn’t fog – it was water (Whipple – 1940). The [combination] of a 16 to 20-foot tidal surge and wind gusts that may have reached 150-mph – leveled 1 out of every 3 buildings along the coast of eastern Long Island, southeast Connecticut and southern Rhode Island. Along the open-ocean facing coastal roads in Rhode Island and Long Island – the damage was horrific. Whole beach communities were swept away – some without a trace. The greatest sufferers of the hurricane were undoubtedly the residents of Napatree Point in Watch Hill, Rhode Island. This was a beachfront area, filled with large homes built on the beaches only yards away from the Atlantic. This was one of several areas entirely wiped out by the hurricane. It was all I could do to close the front door against it. Spray and sand came under the door. … I watched sand piles built up on the floor. Debris that had gone to sea with the wind from the northeast began to come back and crash on the house. A piece of the roof went and …[in] a few minutes I was ankle deep in the water. Shortly after I got into the boat, I heard a different scratching, and looking, I saw I was going over some treetops. (They are twenty feet above the usual water level.). Soon my boat stopped, and debris began piling up against it. Helen was out to sea for 12 hours, until a rescue boat picked her up. Another amazing survival story was of one Rhode Island family who noticed the water seeping into their three-storey home. They realized the ocean water had surrounded the house but it was too late to escape, so their only way was up. The waters flooded the first floor, so the family moved to the second floor. The waters flooded the second floor, and to the third level they climbed. Finally in the third floor of the house with no where else to go, the house gave a tremendous shudder and was cast into the swirling waters. The family clung to the floorboards, and miraculously, the section of that house stayed intact. They floated all the way to Connecticut. I’m sure they appreciated their skillful carpenter from this! Not all stories had happy endings. Arthur Small, lighthouse keeper of New Bedford, CT, was duty-bound to keep the cape lighthouse lit; but he was concerned for his wife’s safety. He sent her away from the danger of the lighthouse, only for her to perish while fleeing for safety. You can read their story at http://www.pbs.org/wgbh/amex/hurricane38/peopleevents/p_small.html. After the shock of the hurricane, which waned at around 7pm that evening, looters pillaged the cities and violence erupted in areas. Even after all the tragic events of the hurricane, storm surge, flooding, looting, and aftershocks of seeing the destruction the next day, The New England Hurricane got hardly any mention in the newspapers. They were, instead, filled with pre-war provocations in Europe. New England has been on its own before the hurricane, and they were on their own after. Americans hardly knew what had happened. Oh my goodness! 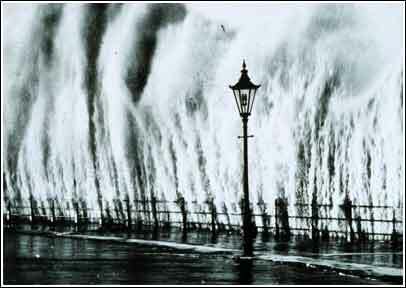 Can you imagine seeing a big wall of water coming towards you? It must have been awful. I wonder how many people (including me) have never heard of this? It was only a few years ago I learnt of the Great Flood in 1953 in the UK and Holland that killed more than 1830 people in holland alone. I really hope our governments have learnt something from these tragedies. It reminds me of the tragedy in 2004 Boxing Day at Phuket, Thailand. Sigh… I lost my boyfriend there. Great post – my mm and her family were at Martha’s Vineyard during this and my grandfather took some amazing photos – you’re inspiring me to post one of them maybe, and when I do I will link to you! I had family who lived in NY and CT at that time, but I never heard any of those stories. Apparently I’m not alone. Nice series of posts on this. It was New Bedford, MA not CT where the lighthouse keeper’s wife died.